Update: How about a look almost 3 years into the future for another review of this beer? Read below then click over to see how it compares. Better pictures, too! You may remember me telling you about the great salesmanship the worker at Total Wine had a few weeks ago. He gave a lesson, he recommended his favorite Belgian beer, and he closed me. I've been dying for two weeks to open this one up since that day, but haven't had the time or alcoholic prowess to drink the whole wine bottle. But now is the accepted time. 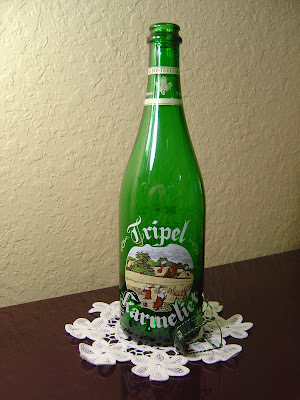 Tripel Karmeliet, family brewed by the Bosteels Family and Brouwerij Bosteels in Buggenhout, Belgium is a 3-grain ale made with Oats, Barley and Wheat. The green 75cL bottle is very nicely decorated as well, a nice touch. Alcoholic content is 8.4% which is not nearly as high as some of the other Belgian beers I've had, but it seems to be about the right amount. You can tell that there's some carbonation in this one. Hey Big Spender (this one's not cheap), opening the cork, not for just any guy, there was a pop like when you open champagne. Then an immediate rush of fruit, slight floral and slight earthy tones right to my nose. The taste is really, really nice. There is a very spicy start, with cloves and nutmeg dominating. But then this beer keeps evolving, showing great fruits, mainly banana and sweet apples, with some honey flavors as well. The alcohol is noticeable but very welcome and balanced with the sweetness. A smooth and buttery finish. I think this may go well with food, but even better as a dessert on its own. Truly a fantastic beer. Now I gotta stop typing so I can put this baby to bed. (And not my 2 year old; he's already down for a nap). NEW BELGIUM SUNSHINE WHEAT BEER METAL SIGN NEW!! !